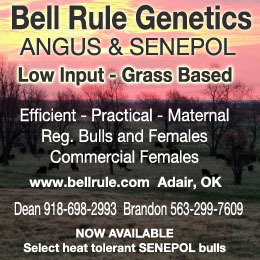 This SARE supported on-farm research project is so full of information and lessons learned that it’s worth your while to read no matter what kind of livestock you raise. 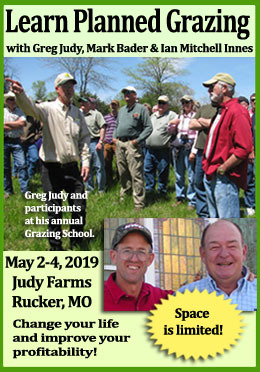 In 2009, Jane Hansen received a North Central Sustainable Agriculture Research and Education (SARE) grant to see if she could renovate a long fallow pasture by intensively grazing feeder lambs and goat kids along with pastured poultry. 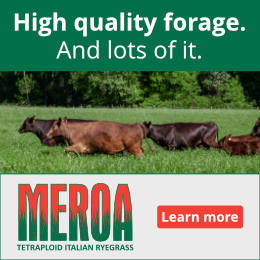 She had found that, while there was a lot of information about how rotational grazing can be a profitable part of a farming operation, there was much less research on converting brushy pasturelands back into productive pasture with intensive grazing. She had heard stories of good results, but found nothing documenting changes along the way. With her project, she added to the knowledge base to help her fellow farmers. Jane and her husband, Chris Wallner farm 40 acres near Prentice, Wisconsin. Thirty-two of those acres are enrolled in Wisconsin’s Managed Forest Law program, a sustainable forestry program that reduces taxes for participating landowners, and even parts of the farm not enrolled in this program are managed to preserve wildlife and insect habitat. Jane and Chris work hard to reduce their dependence on fossil fuels, and they gladly share what they do and how it works for them with others interested in doing the same. Their house has been featured on a number of solar home tours to help folks considering remodeling existing homes to take advantage of the sun. They raise and direct market pastured poultry, vegetables, herbs, garlic and greens. 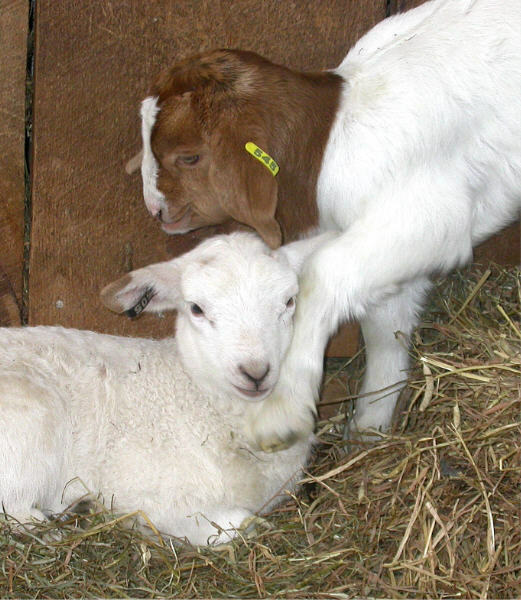 For this three year project they raised 24 – 40 lambs and goats per season. Jane began her project in Spring of 2009 by setting up her electric fencing to keep the livestock in and the predators out. (“We even got a bear stuck inside the fence boundaries while the fencing was being installed – but that is another story…” Jane said.) In late May, Cindy Banh, a plant biologist, did a plant survey so they would know what they were staring with. She repeated surveys in late May of 2010, and June and September of 2011. Once the animals were grazing, Jane tracked paddocks grazed, and grass height when animals started and left. This is a lot of work when you consider that sometimes she was moving the animals twice a day. 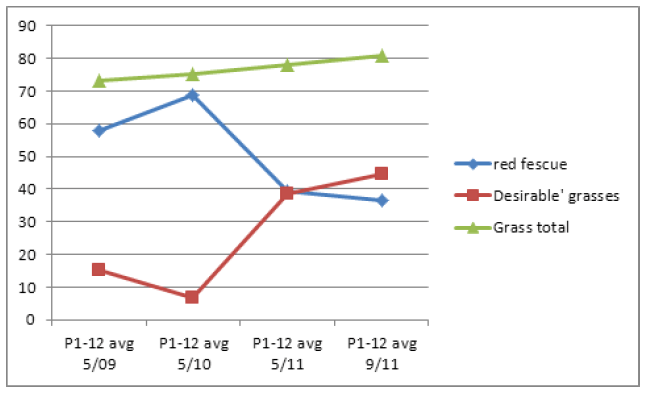 She also collected forage samples in 2009 and the summer of 2011 and collected soil samples twice during the project. “Weather certainly had an impact on workload and data results. 2009 was basically the last of a long series of mildly droughty years. We are on fairly low heavy ground, so mild drought didn’t impact us in an especially negative way, but rain certainly can, as we learned in 2010. We received nearly twice as much rain during the growing season in 2010 as we had in 2009. Jane’s experience, similar to everyone else’s, is that “three years are not enough time to see real dramatic changes in pastures through management intensive grazing with limited inputs.” But she did see some improvements. 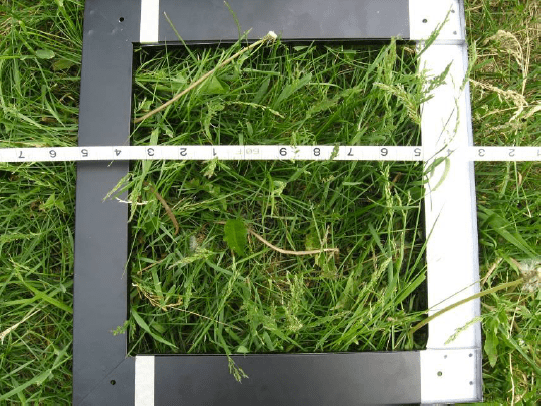 The plant survey data showed that preferred grasses (reed canary grass, timothy, Kentucky blue grass and quack grass) were beginning to increase and compete effectively with the undesirable red fescue covering most of her pasture. Jane did not lime her pastures during the project because she was trying to control the number of variables. She also had anecdotal information that the pH might increase through rotational grazing and this was an opportunity to see if that could be observed. What her test results showed is that the average pH dropped from 5.55 in 2000 to 5.11 in 2011 and the average organic matter went from 7.21 to 3.69. Her conclusion is that, “the anecdotal changes in pH through grazing might be really minor and I would strongly advise other farmers with extremely acidic soils like mine to make the investment in liming one of the first priorities on their farm.” Based on her results she applied 3 tons/acre of lime on her pastures and frost seeded alsike clover because it has the best chance of thriving in an acidic environment. Want to read more? You can download the complete final report by clicking here.